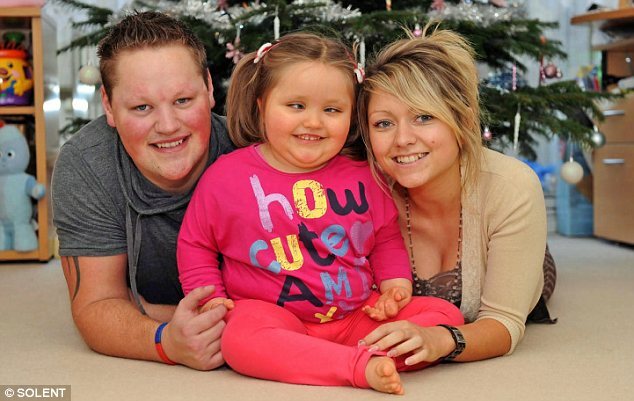 A little girl who has been blind since birth has seen her mother and father for the first time - at the age of four. Izabelle Evans can now see up to three feet in front of her after groundbreaking stem cell treatment in China costing £50,000. Parents James Evans and Hollie McHugh said nothing could beat the feeling of the first time their daughter looked into their eyes and said: 'mummy' and 'daddy'. Hollie, 24, of Hayling Island, Hampshire, said: 'The results were better than we could ever have dreamed of. Izabelle was blind from birth after being born with Septo Optic Displasia - a congenital condition which affects just five in one million babies and also causes hormone deficiency and mobility problems. It means she had only a few hundred optic nerves to her brain whereas she needs millions to be able to see. Her parents decided to send Izabelle for treatment in China after researching her condition on the internet and raised the money needed in just over a year. Her parents had hoped the controversial stem cell treatment - which is not available in the UK - would improve her sight, speech and mobility. It involves injecting the spinal canal with cells taken from the umbilical cords of healthy babies. The cells are then used to rebuild the optic nerves. Hollie said: 'We've seen lots of changes. Her speech has improved a lot. Before she went she could only say one or two words but now we can have a little conversation with her. 'Her walking has improved and she can support her own weight on her legs now. 'Because she has not used her eyes before we have to remind her to use them. She went back to school and they have seen a difference too. 'She picks things up and holds them close to her face. A couple of days after we got back I put the Christmas tree up and she reached out to grab for the lights. 'Last year she wasn't even aware we had a Christmas tree. It's just amazing. I can't wait for her to open her presents and experience it all for herself. The month-long stay in China's Qingdao Chengyang People's Hospital was not easy for the family. Izabelle had to endure gruelling treatment with just two days off a week. She often became very upset when having the stem cell treatment and it was hard for her parents to see her in pain. Izabelle also had acupressure, standing therapy, physiotherapy and electric wave therapy to stimulate her tight muscles, which is another aspect of her condition. Her father James, 24, said: 'We're going to wait six months because the stem cells continue to work for six months if she stays healthy.